For many years the development team at Allen were keen to design a trapeze system that improves the safety of the sport and reduces the risk of entrapment by the traditional hook-on trapeze harness. Designer Julian Bethwaite had also been thinking along the same lines and had produced a prototype of the keyball trapeze system. 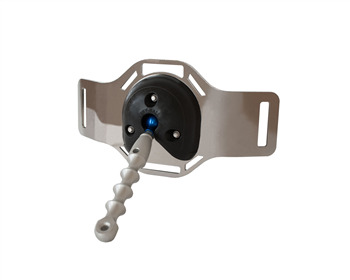 In conjunction with Bethwaite Design, Allen have developed the concept into a sleek and innovative design, eliminating the hook altogether and creating a safe intuitive solution that really works. A solid aluminium guide with an integral rope-friendly thimble for attachment to the wire via a height adjustable rope. A 3D moulded keyhole with a wide opening guides the ball securely into place when trapezing whilst easily releasing when required. A stainless steel back-plate in either narrow or spreader format allow for easy changing to suit different designs of harness.